Directions to Drop. The Coffee Spot. 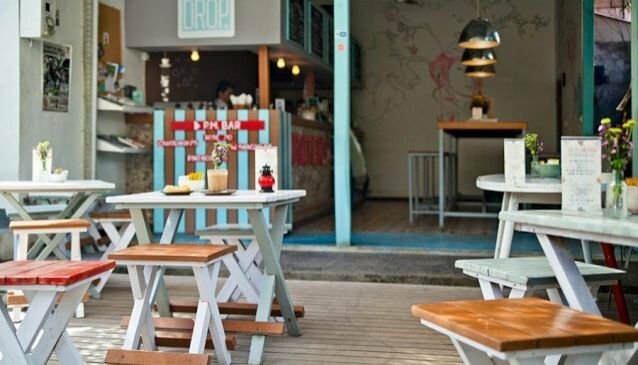 This attractive little café is the perfect place for people watching while sipping on a macchiato. Grab a stool outside and watch the world pass by There are great breakfasts, soups, quiches, and sandwiches but it's the Coconut Fluff that we recommend, a latte made with coconut milk. With a drinks list as long as your arm, no one has ever gone thirsty here. Espresso. Cappuccino. Latte. Macchiato. Flat White. Lemonades. Juices. Chai. Herbal Tea. And they have a killer food menu too. Take a seat inside or out for a big meal or small - this super cafe offers super affordable and totally delicious meals at a mere $6AU - $12AU. You can expect anything from fluffy muffins to bright bruschetta and even sweet sticky crepes on the menu. Their homemade thin crust pizzas will satisfy even the fussiest eaters and they have salads for the health conscious.